Current resume formats are obsolete & detrimental because they don't convey relevant experience quickly to a potential employer. Companies are therefore using feckless computer programs to mechanically sort job submissions based upon text phrases perceived to be applicable to the position. This faceless technique obfuscates a person's true potential and relies on a Vegas-like culling process inevitably resulting in competent candidates being overlooked. There has to be a better way for both the aspiring candidate and the overwhelmed human resources person. Convey a person's total skill set. Add intriguing "jobs done" titles piquing an employer's interest encouraging questions and dialogue. Enhance "jobs done" by including non-business areas of interest. 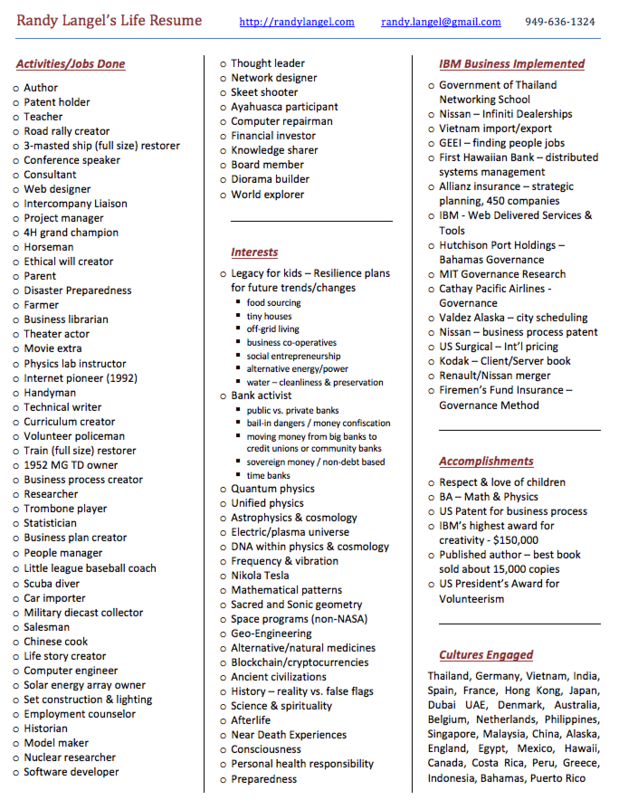 Incorporate personal traits/interests augmenting a job's business requirements. Use as much white space as possible. Do it all in one page. Randy Langel has over 25 years of business and technology acumen. In recent years, Mr. Langel has leveraged his expertise in structuring and attaining competitive advantage by infusing agility into both Business and Information Technology groups within various companies. He is an authority on identifying and developing opportunities, methods and implementation scenarios that allow business and technology units to compliment and re-enforce each other in order to improve a company’s bottom-line. His creativity, planning, innovative nature, ability to work with abstract concepts, and next level thinking extend those results with concrete mechanisms to control, measure and record progress going forward. Mr. Langel has established himself as a thought leader in the areas of SOA, governance and business agility based on his patent, published books, management method, and distributed curriculum focused on SOA Business Value. His list of global clients includes Hughes Aircraft, Royal Caribbean Cruise Lines, Office Depot, US Surgical, Bridgeport Hospital, Town of Greenwich CT, Cathay Pacific, Hong Kong; Australian Revenue & Standards, Canberra; Hutchison Port Holdings, Hong Kong; Ministry of Technology, Bangkok; and Dubai Municipality, United Arab Emirates, to name a few. Nissan, Tokyo - Simplified the interrelated components of business and IT governance, thereby, reducing complexity and stimulating faster implementations. The resulting SOA Governance Topology Technique reduced costs and allowed employees to more easily understand the governance processes. Project was completed on time and within budget, generating $2M in revenue. IBM - Led worldwide project to identify the structure, method, and artifacts of business and IT agility environments. Created concept, proposal, deliverables and documentation for new innovation initiative, Business-Agile Enterprise, which yielded agility techniques, validation of business/IT convergence, and creation of justification methods. Fireman’s Fund Insurance - Created the company’s SOA Governance plan. This was the first of its type and is now being used by IBM Consulting worldwide under the title of the IBM SOA Governance and Management Method. Engagement was worth $6.5M. Nissan, USA – Designed and implemented the dealership system for the Infiniti car division. The initial rollout was to 35 dealers, however with added function it has since expanded to all dealers in the US. Allianz, Munich - Created the Governance Dimension of the company’s SOA Framework Method. This included two new techniques for their SOA Center of Excellence; Governance Performance Measurement for 15 of their largest subsidiaries, and a modified technique for HQ. Jobs Done - Description of a past activity either personal or professional. This component uses only one line with the number of words prescribed by the column width you have chosen. Titles should be creative and colorful in order to pique the reader's interest. Interest generates questions and questions establish a dialogue. Subject Areas - Business tasks performed. This item can take up no more than two lines with the number of words prescribed by the column width you have chosen. The words used here should be business oriented only and pertain to the job you are seeking. Interesting Business - Specific companies with which you have interacted and a concise description of the work realized. This item can take up no more than two lines with the number of words prescribed by the column width you have chosen. If you would like a copy of this new resume format in Word, just send me a message.